Before shopping for a new foundation wardrobe it’s essential to decide what kind of finish you like – as in matte, velvet, dewy – and what kind of formula you find easiest to apply. You may love the ease of a liquid longwear by night but prefer a cushion during the day for a more dewy, handbag-friendly option. Your skin type also plays a vital role in your choice of base, and having two different formulas for the warmer and cooler seasons are a veritable no brainer. Even if you don’t want a more tanned look during summer you’ll need a lighter formula that works with the humidity, and in winter every skin needs a little more nourishing care to protect against the effects of the cold. I am never without a cushion for on-the-go application, and with good reason. They seemed to come out of nowhere and then there was an onslaught, with every brand worth its salt eventually unveiling their own formula. Cushion foundations, cushion blushes, and even eye shadows are ultra-popular in South Korea and have been for a few years now, and finally the Western world caught up on the trend with good reason. When used correctly they give you a near-flawless finish, and they are an absolute godsend for both travel and touch ups on the go. Cushion foundation compacts basically contain a sponge soaked in foundation, and they are designed to create a smooth, uniform canvas that minimises shine factor and gives you that dewy finish we all want, with moisturising and protective benefits often thrown in to boot. You can use brushes or a beauty blender to apply the foundation formulas from most brands, but the compacts generally come with antibacterial sponges that are perfect for application and touch ups. 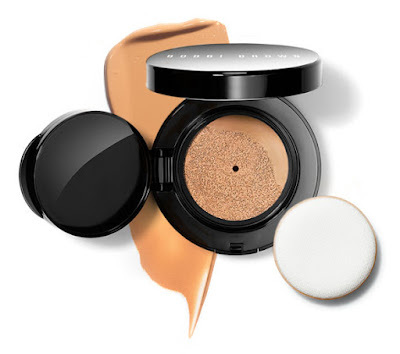 Known for their famous Skin liquid foundation, Bobbi Brown also offers Skin Foundation Cushion Compact, which has the weightless feel and coverage of a liquid foundation but in the convenience of a compact. The skin-boosting formula is infused with Caffeine and Pink Silk Tree Extract and instantly replenishes skin's natural plumpness, while soft-focus, skin tone correct pigments seamlessly cover blemishes, redness and unevenness. I love that unique capsules keep the foundation fresh with each use, and the airtight compact is a breeze to refill - just drop a new capsule in and you’re good to go (also planet-friendly, which I like). When I want a more polished, full-coverage look, I apply the buildable formula with Bobbi's Full Coverage Face Brush - the ultra-soft, tightly packed bristles deliver the ultimate HD finish. Magic.